The Schmitt Mennonite congregation near Woodbridge, ON began services about 1824. Membership began to decline following the 1875 division that led to the Mennonite Brethren in Christ Church. The congregation was also hurt by the Old Order Mennonite division of 1889. The Mennonite Brethren in Christ were the last to use the building. 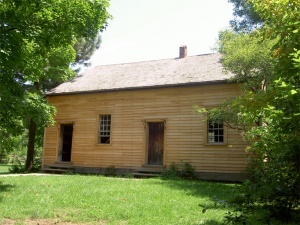 The Schmitt meetinghouse, now located at Black Creek Pioneer Village in Toronto. The photographs were taken in 2004 shortly after some extensive restoration of the building. The families of the settlement emigrated from Pennsylvania about 1803. Peter Musselman was the first minister; Christian Troyer was ordained after Musselman's death in 1830. Daniel Brundage became the minister about 1845. 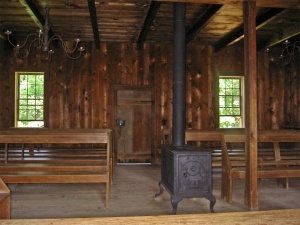 The meetinghouse, the oldest remaining in Ontario, was erected in 1824. Around 1875 membership reached 50, its highest total. The congregation dissolved in 1923. It had been affiliated with the Mennonite Conference of Ontario (1824-) and the Mennonite Brethren in Christ Church (1883-1923). The language of worship was English; the transition from German occurred in the 1890s. The church was located on the east side of Jane St., 1 km north of Hwy. 7. In 1976 the building was moved to Black Creek Pioneer Village at Markham. Schmitt was also known as Edgeley Mennonite Church. Mennonite Reporter (15 November 1976): 1. Fretz, Joseph C. and Marlene Epp. "Schmitt Mennonite Church (Woodbridge, Ontario, Canada)." Global Anabaptist Mennonite Encyclopedia Online. April 1986. Web. 22 Apr 2019. http://gameo.org/index.php?title=Schmitt_Mennonite_Church_(Woodbridge,_Ontario,_Canada)&oldid=142084. Fretz, Joseph C. and Marlene Epp. (April 1986). Schmitt Mennonite Church (Woodbridge, Ontario, Canada). Global Anabaptist Mennonite Encyclopedia Online. Retrieved 22 April 2019, from http://gameo.org/index.php?title=Schmitt_Mennonite_Church_(Woodbridge,_Ontario,_Canada)&oldid=142084.